Due to popular demand, I will discuss about early third Command Centre in TvP. This build is getting more and more common recently. I thought of posting this a month ago, but I didn’t because I had an impression that there wasn’t enough “meat” to it. There really isn’t anything special about the build, but it is interesting why it works in the current metagame. Here are some examples of it. It is basically a Reaper expand and take Scvs off gas to put down a third Command Centre instead of three Barracks. This is a perfect situation to apply the building block logic. It will look something like this. 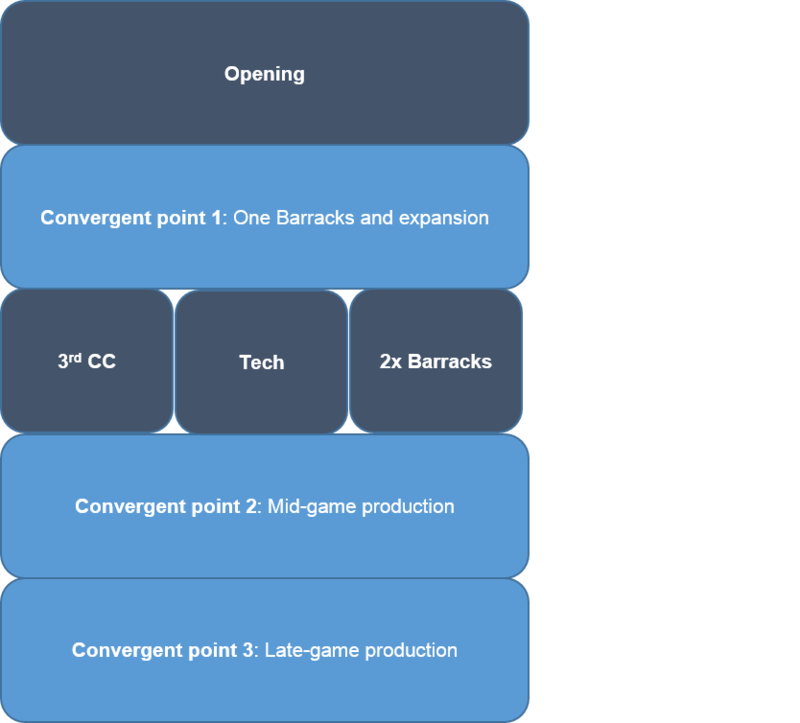 The most common bridges between convergent point 1 and 2 are tech (Factory-Starport) and three Barracks. It is usually hard for Terran to get away with an early third as Protoss can punish Terran in various ways. This general understanding of the match up has been a paradigm for a long time. Terran usually put down the third Command Centre (or two more Barracks) after convergent point 2. The early third Command Centre is basically shifting the third Command Centre to the front with everything else similar. Personally, I have done this before just to mix things up, but it wasn’t common. The reason for it be as common as it is now is due to the metagame. As discussed previously, the current metagame is heavily revolving around Widow Mine drop and how Protoss deal with it. The most effective build against Widow Mine drop is to have a Stargate as the first tech, and uses the Oracle to delay the drop. Subsequently, Protoss will make Phoenix and streamline back into a normal standard game. The Phoenix build does not allow Protoss to have a strong offensive potential to punish the early third Command Centre like other common builds like Twilight Council and Robotic Facility. Let me explain why it is effective using logic. The classic TvP is based on three Barracks production versus Gateway and Robo production, and there is a consensus that it is even. That means, both sides can’t really damage each other because the units are well matched in general under normal circumstances. The Widow Mine drop metagame shakes this up a little, as it pushes back the normal bio production for early damage. This also allows Protoss to push back their standard production for Phoenix production, which is meant to counter Widow Mine drop. Therefore, both sides delay their standard production in favor of tech in the current TvP metagame with Terran being the offender and Protoss being the defender. Stemming down from the above observation, the early third build, which delays the bio production, becomes variable as Protoss also delay the classic production. Given that Protoss are delaying the classic production for defensive tech (i.e., Phoenix), Terran can afford to be economical. This is because of the general “aggressive > economical > defensive > aggressive” rock-paper-scissor logic in StarCraft. Protoss have the build advantage with Phoenix to counter Widow Mine drop, because it is a “defensive > aggressive” game. However, with the early third Command Centre, the build advantage shifts back to Terran with a “economical > defensive”. With that being said, I am not saying that Protoss cannot punish Terran’s early third with the Stargate tech, but it is relatively hard. The vod below shows that Classic scouted the third Command Centre at around 7:00, it is hard to reactively “punish” the early third Command Centre. At best, Protoss can cut corner and put down an early third themselves, and this is getting common too. In my opinion, it is much more important and rewarding to understand why pros are doing certain things, instead of just following the pros. Often, I read people asking if X is viable on /r/allthingsterran, and others will give an answer that is along the line that “I don’t see pros do this any more, so……” Perhaps this is oversimplifying the rationale behind the decisions made by the pros. To end this post, I will link the below vod between TY and Classic. TY opened up with a Command Centre first with Barracks then Refinery, and this is basically replacing a Reaper opening with a Command Centre first. Then, move on to a tech bridge into the mid game (usually Widow Mine drop). Classic scouted the opening, and hence, TY decided to change the build to an early third Command Centre. If Classic decided to play it out like a typical game in the current metagame, TY will have the “economical > defensive” advantage.